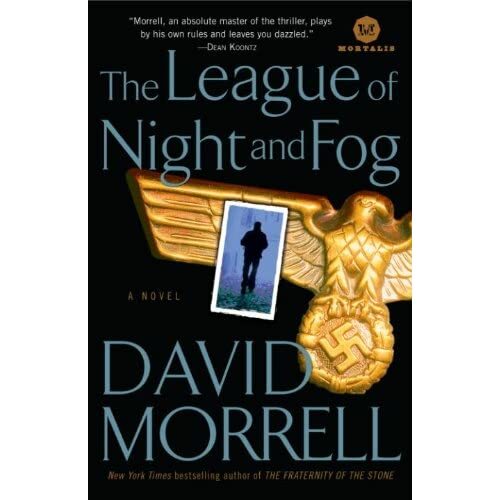 David Morrell follows up on his previous spy novels Brotherhood and Fraternity with this double sequel, The League of Night and Fog. The two protagonists from each of his previous novels, Saul and Drew, team up. The plot mix includes Nazis, ancient Mossad agents, international assassins and, of course, the CIA. The author begins the book with a truly chilling description of the atrocities the Nazis perpetrated against the Jews during the war. In just a few short pages, the distinction between the concentration camps and a death camp is starkly drawn. Thousands were placed on trains, taken to the gas chambers and killed. This would be done first thing in the morning so the rest of the day could be spent clearing out the bodies. Understanding the full extent of this evil is crucial to setting up why there are still people eager to bring anyone involved to justice. This is a thriller, so there are the required number of chase sequences and shoot outs. For those who have read the previous two books, the moment when Saul and Drew meet is truly exciting for those who’ve read the first two novels. If the finale is a little bit anticlimactic, it’s still a fitting end to the novel and wraps things up rather well. The ebook version includes a short story that brings a bit of closure to Saul’s journey. Although it may be a bit of a let down for where some might have wished his character to go, it is an exciting story that adds on to Morrell’s earlier idea of spy safe houses. As a bonus, here’s a link to an interview with the prosecutor that is still, even now, tracking down Nazis in America.